Hannah graduated from the University of Liverpool in 2012 and has recently joined the Southfields team as one of the vets. Hannah does however have a long history with the practice as she worked alongside Claire as a student sicne has was 13 years old! Hannah has just moved back to the area with her partner Marcus to be closer to home, having lived and worked in the Peak District for the last 5 years. 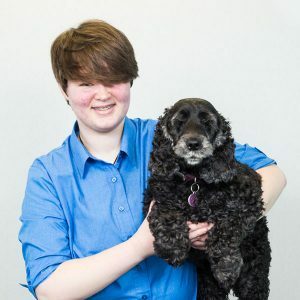 In her spare time, Hannah enjoys walking her two dogs; Peaut the Boder Collie and Betty the Shih Tzu cross (an unlikely pairing, but best of friends non the less!) She also has Tom the cat, Woodie the Horse and Leonard the Hamster! Some of our clients might remember Lizzie as she worked with us for 6 months after graduating from Liverpool University in 2010. Lizzie moved back to the area and re-joined the practice. 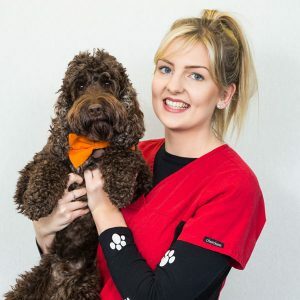 With a strong interest in Dermatology, she recently completed a postgraduate certificate in Advanced Veterinary Practice to further her knowledge. When she's not looking at parasites down the microscope, she also enjoys surgery and medicine cases. Lizzie has two cats; Archie and Bertie. She enjoys cooking and going for walks but at the moment most of her spare time is spent planning her upcoming wedding! 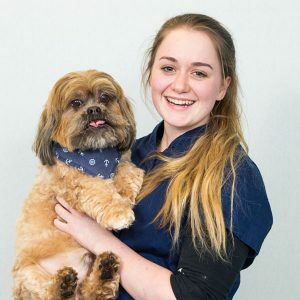 Charlotte graduated from the University of Liverpool in 2017 and headed straight to Southfield Vets! Charlotte first started seeing practice with Southfields when she was 15, so starting work has felt like coming home. Charlotte has moved back to Manchester from the Wirral and currently lives at home with a Lhasa Apso called Teddy and a Lion Head rabbit called Honey who recently turned 10! In her free time, Charlotte enjoys eating biscuits and making cakes. 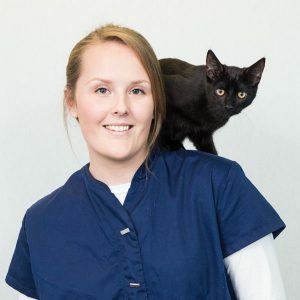 Jade joined Southfields in September 2010 and completed her Veterinary Nursing Degree at Myerscough College in 2013. She is also a qualified PHC (Pet health counsellor) so can give you plenty of advice on weight and nutrition. Jade recently got married and their beautiful baby girl, Harriett, was born in 2017. Whilst not in work she enjoys walking her 2 dogs, Rosie, a bouncy Springer and Ella, a mischievous Sprocker, she also has a handsome Chameleon called Pascal! Tasha joined the practice in 2014 as a student nurse and qualified in 2017. Tasha has a special interest in feline medicine and is currently undertaking a further qualification in this area. She has 2 Cavalier King Charles Spaniels called Penny and Bailey and 2 naughty cats called Anakin and Logan. She is always at the cinema and gives us her latest reviews! Paula is our Head Nurse and has been with us since Southfields opened in 2006! 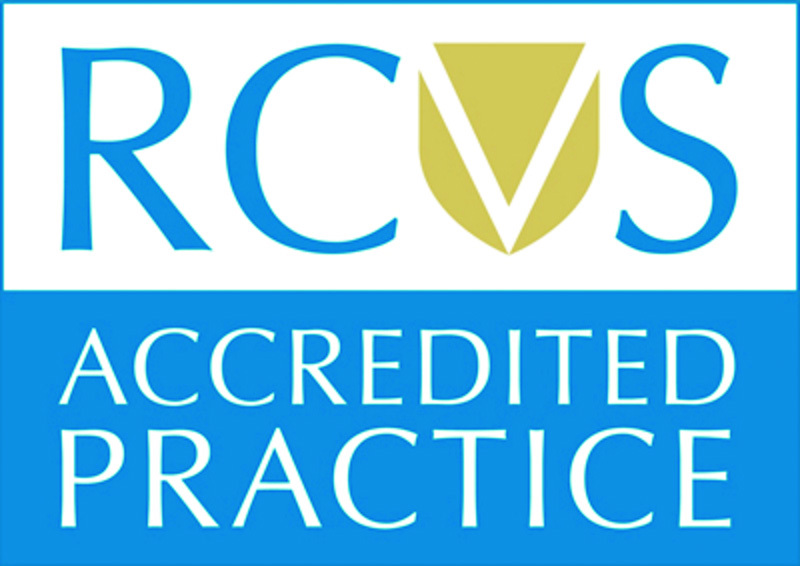 She brings a wealth of experience to the practice as she has been qualified for 25 years. Paula is an avid Manchester United fan and has a son called Ronnie, who keeps her busy with football training and watching all the matches. She has a cat called Scooby, a Corn snake called Flash and a guinea pig called Henry. Amy is our Apprentice Veterinary Nurse; she joined the practice in march 2017 and starts training at Myerscough College in August 2017. Amy enjoys horse riding and going for long country walks with her two crazy cockapoos Bailey and Tilly. 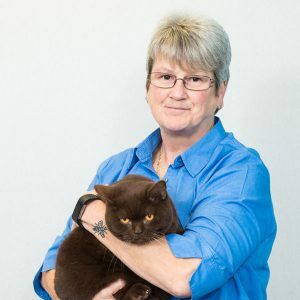 Maxine Dutton previously worked at Clarendon Vets, and after a few years working for the NHS, we are proud to have her return to work with Claire and the team at Southfields. 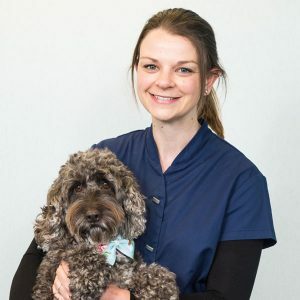 She is an experienced veterinary nurse but prefers to work now on Reception in particular dealing with our clients' insurance claims. Carol is the first person you will usually meet welcoming you to our practice. 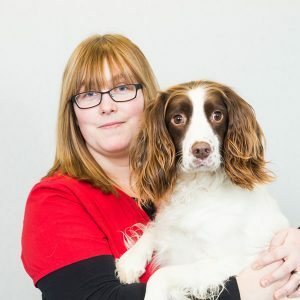 She is our unflappable receptionist and Health & Safety guru who also runs First aid training courses for staff and other veterinary practices. 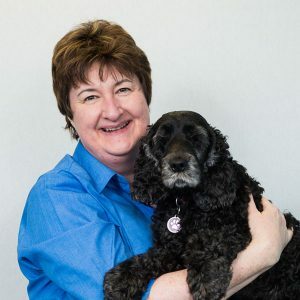 Before starting with us in 2006, Carol served for 15 years as a manager in the pharmaceutical industry, followed by 5 years as a childminder and First aid trainer whilst bringing up her 3 children. Jex has been working at Southfields since September 2016 as a work experience student. 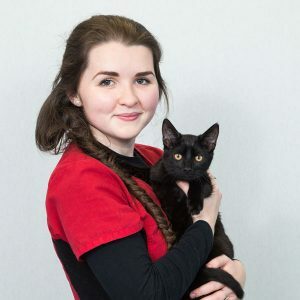 She hopes to become a Veterinary Nurse and attend Myerscough College 2018. When she is not at the practice, Jex likes to spend time with her two rabbits, Timmy and Simba. Also, she likes to build experience with other animals and works at an exotic animal education centre where she handles and trains a range of animals. These include birds of prey, continental giant rabbits, ferrets, tarantulas, chameleons and snakes.